Hazel's Quilts: 2012 CHRISTMAS QUILTALONG! Hip hip hooray! The Christmas Quiltalong for 2012 starts HERE! So are you all ready? Tinsel? Holly? Sherry?(no! too early! ), Christmas music? Sleigh bells? 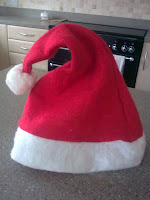 Santa hat? Christmas Chocolates? You are not allowed any further until you have a least one of the above list to hand! So what projects are we all up to on this festive morn? We have part one of QuiltSue's Festive Mystery quilt over on the Christmas QAL tab at the top if you fancy that, but whatever you are up to, sign in to Mr Linky and join in the fun! (Drop me an email if you'd prefer the instructions emailed to you for ease of printing out). 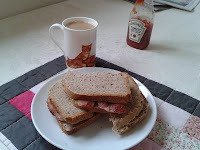 I'm off to go to have a root through the stash to choose my fabrics for A Festive Mystery, right after I've finished my breakfast bacon sandwich - see you later! I'm here! Don't you always the early bird who turns up before you've even got your party frock on? I've just had a cup of hot chocolate with cream on, that counts as festive food, doesn't it? Off now to do some sewing. Got the pot a brewin' and ready to cut. Going scrappy with the few seasonal fabrics I have. May even find that panel hidden away. My post isn't up yet, but I'm ready to begin. We have some snow so it's a good day to stay in and sew. I'm going with the chocolate cookies from your list. Chocolate anything sounds good to me. It's 5:30am here in California. Let me get the sleepy dust out of my eyes, fix a cup a coffee and I'll join in the Christmas quilting marathon. Yup, I finally made it! I'm up early, just didn't get to my sewing corner yet! Nice job hosting, Hazel. Kudos to you! It's 10 a.m. here now. Your day is done, mine's just beginning. I've got Christmas music on and I'll have some morning Christmas (non-alcoholic :)) cheer. I have a question about the mystery quilt. Can you tell me if it is suitable to make truly "scrappy" - ie can the dark, medium and light pieces be cut from my pile of Christmas fabric scraps? Let me know if I should address this question to Sue. oh my I am late to the party! I spent soo much time thinking about what i was going to work on that i forgot about the whole thing...lol I was cutting Christmas fabric and then thinking..okay why am i doing this....opppps sorry!